The (Non) Runaway Bride - Andria Corso & Co.Andria Corso & Co. It was late September, and there I was riding in the back of a black stretch limousine wearing a wedding dress. I was on my way to the wedding I’d been planning for most of the prior year, and the closer we got to the church the more I began to sweat. My dad and sister were with me: father-of-the-bride and maid-of-honor. They were excited, “You okay Andria?” “Ready, Andria?” I smiled bravely but my heart knew something was wrong. We arrived at the church and snuck in the side door so no one would see me prior to my walk down the aisle. I peeked through a window into the congregation area to see 200 people eagerly waiting. I saw my soon-to-be husband approaching the end of the aisle with his seven groomsmen trailing behind him. I heard laughter and saw people hugging. Everyone was happy and excited. My bridesmaids were lining up and their procession music began to play. My stomach lurched. “No,” I said, “I’m definitely not fine and I need to throw-up.” I yanked her into the bathroom with me. “Hold my veil and hair back please,” I said as the sweat began to seep through my dress. I was suffocating. I wanted to rip the dress off. “Oh my God, you’re serious!” My sister said. I looked at her with scared eyes and nervously nodded in agreement. We breathed through my nausea. She fanned me and put a wet paper towel on my neck. She hugged me. Every fiber of my being was telling me to not walk down that aisle. Every part of my body and soul knew that, despite how wonderful the man at the other end of the aisle was, he was not the man for me. And yet, there was a church full of 200 people waiting and my dad ready to walk me down the aisle. There were the promises I had made. My mind told me I had to do this, and my body and soul screamed no, run the other way. I wanted to. I felt myself start to turn towards the exit. And then the voice of my fear jumped in: What will everybody think? What about your fiancé? What about the 200 people sitting in the church? What will you tell them? What about your parents and grandparents? You’ll humiliate yourself and so many others. 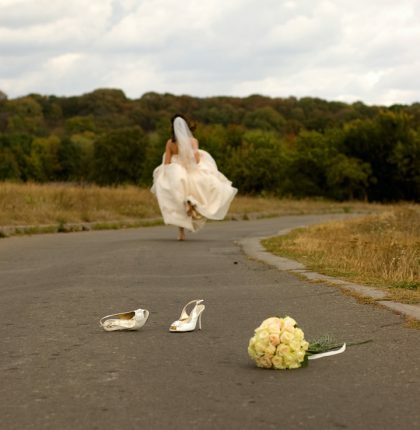 What are you going to do, be the runaway bride?? We walked out of the bathroom to see my dad waiting with a slightly nervous grin. “You okay, Andria? Ready?” He asked. I watched my sister make her way down the aisle ahead of me, and I proceeded after her shaking every step of the way, clinging to my dad’s arm. I’m not sure how I actually walked down the aisle but I did. I got married that day twenty-plus years ago. My fear won that day and my body and soul knew it. A year later I was divorced. This is a not-so-small example of what happens when we don’t listen to our intuition and we let the voice of fear drown out the voice of our intuitive self – the inner guide that always knows which way to lead us. I wish I could say it was my only example of ignoring my intuition, but I have many others. Some are big, life altering ones and others are smaller but the result is always the same. When we allow our fear to choose when our bodies and souls know there is a much better way to go, we end up on paths that are not aligned with who we truly are – just like when I walked down the aisle over two decades ago. My body was telling me. My insides were screaming at me and I ignored all of it. Truth is, the mind can talk us into and out of anything but the body never lies. The body is always giving us messages about which path is best. We can ignore the body and often do; yet, when we pay attention we learn that it never leads us astray. It is aligned with our intuition, that inner sixth sense that shows up as the “knowing” that’s hard to explain. If you pay attention you can feel your intuition. Mine is in my gut. It literally tugs at me. Looking back on my wedding experience twenty-plus years ago, I realize my gut had been tugging at me repeatedly during the year of wedding planning. The signs seem so obvious now. I had many clues that this wasn’t the marriage for me but I was so far down the path and I didn’t know how to turn around. The more I ignored my intuition and that “knowing” in my gut, the more my body started to react, which became quite evident the day of the wedding. My body was trying to get my attention through the profuse sweating, feeling like I was suffocating, and extreme nausea. It was my intuition’s last attempt to get me to PAY ATTENTION, TURN AROUND, GO THE OTHER WAY. Obviously I didn’t, and it took me many more years of seemingly wrong turns before I realized that the right turn is always the one that feels like peace, freedom, and openness. It may not be the easiest choice but it has the foundation of peace and openness. It does not feel clenched, tight, or create negative body responses. If I were to redo that wedding and be the runaway bride, would it have been a difficult choice? Yes. Would I have hurt others and myself? Yes, but perhaps not as much as I did by choosing to walk down the aisle. 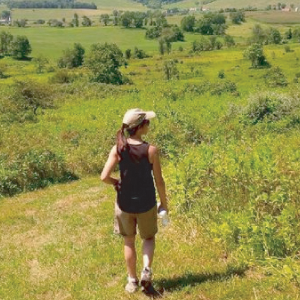 Would I have ultimately felt freedom, peace, and openness? Yes, and probably a lot sooner than I did by walking down the aisle, being in a marriage that was wrong, and then going through the pain of a divorce. By allowing fear to make my choice and being the non-runaway bride, I created an extended period of feeling clenched and suffocated. Had I embraced my longing to run out of the church, I know without a doubt that I would have instantly been able to breathe. And that, my friends, is a clear indicator of which way I was meant to go. This blog was originally posted on The Huffington Post on September 6, 2016. This entry was posted in Blog and tagged Andria Corso, bride, Choices, Decisions, divorce, Expectations, Fear, intuition, marriage, runaway bride, voice of fear. Bookmark the permalink. ← Are You Afraid of Your Doorway to Freedom? Thanks for sharing Stanley. I’m glad the post resonated with you and that Fear to Flow is helping you on your journey!